It was over a century ago that Artcarved designers created the first seamless wedding rings, thus allowing a more comfortable fit. More innovations arose when the excellent Artcarved artisans created rings with more intricate design detail and styling. Artcarved was also a pioneer in popularizing the dual ring ceremony during World War II—where many soldiers would go off for several months at a time. These days Artcarved is producing some of today’s most sought-after rings with unique, intricate and classic designs that come in platinum, 18k white, yellow gold and palladium—the perfect choice for Spring proposals. ArtCarved Three Stone Diamond Ring with Floral Carving .37ct. The three stone diamond ring is a special symbolic touch meant to signify the couple’s past, present and future. 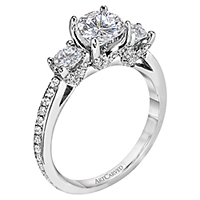 This gorgeous ArtCarved design features two round brilliant-cut diamonds on each side of the center stone. A perfect Springtime proposal option because of the floral carvings with detailed diamonds that circle the band. ArtCarved Three Stone Beaded Diamond Band. Almost a cross between a three stone diamond ring and an eternity band, this extravagant option features two round side stones on a diamond band and is the perfect choice for an opulent and flashy engagement ring that she’ll never want to take off. 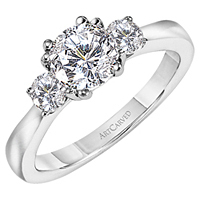 ArtCarved Three Stone Solitaire Diamond Ring .33 ct. 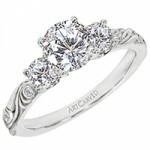 Yet another timeless piece by Artcarved featuring two side stones on a solitaire band. Fitted with a fabulous sparkling diamond on her hand that will sparkle brilliantly as she wears it. This beautiful Art Carved engagement ring features 2 round brilliant cut diamonds on each side of the center stone. It also features floral engraving along the top of the band which is detailed in diamonds. Available in palladium, 18kt white gold or 18kt yellow gold and can accommodate a round brilliant or fancy shaped center stone from .40ct to 4.20ct. Shop all Since 1910 Art Carved engagement rings to find the perfect one for you! This classic Art Carved engagement ring features round brilliant cut channel-set diamonds going half way down the top and both sides of the band. This setting is available in platinum, palladium 14kt white gold or 14kt yellow gold and can accommodate a round brilliant or fancy shape center stone from .40ct to 4.20ct. This beautiful Art Carved engagement ring has a small split shank that features clustered diamonds in the shape of a trillion on each side of the center stone. Available in Palladium, Platinum, 18kt White Gold or 18kt Yellow Gold and can accommodate a round brilliant or fancy shape center stone from .40ct to 4.20ct.